Mega Sale! 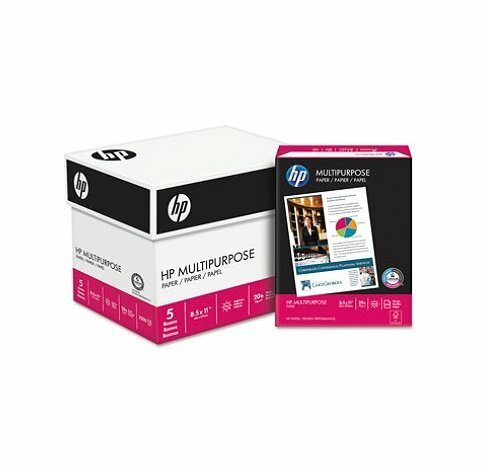 Save 26% on the Multipurpose Paper, 96 Bright, 20 lb, Letter, White, 2500 Sheets/Carton, Sold as 5 Ream by HP at LDP Graphic Design. MPN: PLX386923. Hurry! Limited time offer. Offer valid only while supplies last. Extra bright and white for high contrast images perfect for everyday use. A versatile paper engineered for use in copiers, printers and fax machines. Extra bright and white for high contrast images perfect for everyday use. A versatile paper engineered for use in copiers, printers and fax machines. This product was made from wood that came from a certified managed forest. Size: 8 1/2 x 11; Paper Color(s): White; Paper Weight: 20 lb; Sheets Per Unit: 2500. 20-lb. white multipurpose office paper with a 96 GE brightness rating. High-bright paper for everyday use. ColorLok? technology resists smears and captures bolder blacks and brighter colors.